I first heard of Janusz Korczak when I visited the memorial site at Treblinka in 1998; Treblinka was one of the three Operation Reinhardt death camps in which around 1.5 million Jews were gassed. Included among the victims at Treblinka were 192 orphans from an orphanage in the Warsaw ghetto which was headed by Janusz Korczak, who accompanied the orphans to Treblinka and died along with them. The Treblinka memorial site has 17,000 stones in honor of the 17,000 Polish cities and towns that were destroyed by the Nazis during World War II. 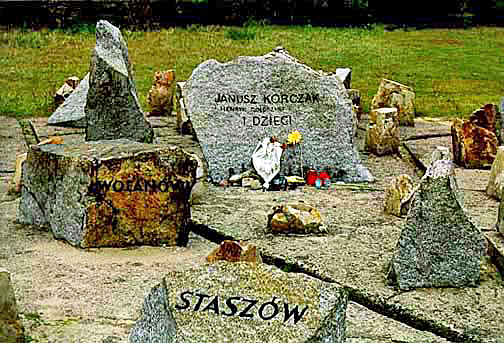 Janusz Korczak is the only individual who has a stone in his honor. Janusz Korczak was a pseudonym for Dr. Henryk Goldzmit, who was a teacher, a social worker and a pediatrician. He also did a weekly radio show for children, and wrote a series of children’s books in which the central character was a boy king named King Matt. In July 1942, Korczak turned down the opportunity to escape from the Warsaw Ghetto, and instead accompanied 192 orphans to Treblinka where he was murdered in the gas chamber along with them. On the march to the Umschlagplatz, the deportation center in Warsaw, where the Jews would be put on trains to Treblina, one child was carrying the flag of King Matt with the Zionist flag on the other side of it. The Zionist flag is now the blue and white flag of Israel. The children were dressed in their best clothes, and each carried a blue knapsack and a favorite book or toy. A miracle occurred. Two hundred children did not cry out. Two hundred pure souls, condemned to death, did not weep. Not one of them ran away. None tried to hide. Like stricken swallows they clung to their teacher and mentor, to their father and brother, Janusz Korczak, so that he might protect and preserve them. Janusz Korczak was marching, his head bent forward, holding the hand of a child, without a hat, a leather belt around his waist, and wearing high boots. A few nurses were followed by two hundred children, dressed in clean and meticulously cared for clothes, as they were being carried to the altar. […] On all sides the children were surrounded by Germans, Ukrainians, and this time also Jewish policemen. They whipped and fired shots at them. The very stones of the street wept at the sight of the procession. One day, around 5th August, when I had taken a brief rest from work and was walking down Gsia Street, I happened to see Janusz Korczak and his orphans leaving the ghetto. The evacuation of the Jewish orphanage run by Janusz Korczak had been ordered for that morning. The children were to have been taken away alone. He had the chance to save himself, and it was only with difficulty that he persuaded the Germans to take him too. He had spent long years of his life with children and now, on this last journey, he could not leave them alone. He wanted to ease things for them. He told the orphans they were going out into the country, so they ought to be cheerful. At last they would be able to exchange the horrible suffocating city walls for meadows of flowers, streams where they could bathe, woods full of berries and mushrooms. He told them to wear their best clothes, and so they came out into the yard, two by two, nicely dressed and in a happy mood. The little column was led by an SS man who loved children, as Germans do, even those he was about to see on their way into the next world. He took a special liking to a boy of twelve, a violinist who had his instrument under his arm. The SS man told him to go to the head of the procession of children and play and so they set off. When I met them in Gsia Street, the smiling children were singing in chorus, the little violinist was playing for them and Korczak was carrying two of the smallest infants, who were beaming too, and telling them some amusing story. I am sure that even in the gas chamber, as the Zyklon-B gas was stifling childish throats and striking terror instead of hope in the orphans’ hearts, the Old Doctor (Korczak) must have whispered with one last effort, it’s all right, children, it will be all right. So that at least he could spare his little charges the fear of passing from life to death. Korczak could have abandoned the orphan children and saved himself, but he didn’t. According to Wikipedia, on August 5 or 6, German soldiers came to collect the 192 orphans and about one dozen staff members to take them to the Treblinka extermination camp. Korczak had been previously offered sanctuary on the Aryan side of Warsaw but had turned it down repeatedly, saying that he could not abandon his children. On August 5, he once again refused offers of sanctuary, insisting that he would go with the children. Treblinka has perhaps had the biggest impact on me so far. About 800,000 people died there. Treblinka was different than the other permanent camps because it was more like an assembly line. People were put on trains from the Warsaw ghetto and told they were on their way to a better city just for them. When they arrived, they walked into what looked like a train station and were told they were going to take a shower before entering. They took off their clothes and then were forced down an outdoor corridor to the gas chamber and were gassed within 20 minutes of arriving. No documents were taken; they were just gotten rid of. Instead of Zyklon B, carbon monoxide was used – a much slower death. This student had made a recent trip to Treblinka. Perhaps the Treblinka story has gone back to the claim that only carbon monoxide was used — in order to make the Holocaust story more horrible. Korczak. What a crafted story. Adolf Berman probably put it together with his sham Warsaw ghetto group “Jewish Psychological Services for Children” or some such name. Korczak, had actually been to Palestine in the late 1930’s I believe. He tried to be a Rudolf Steiner mixed with communism and had a whole theory about orphans being successful in a communal atmosphere. How weird. Orphans need to be adopted and have adopted parents. I think Emmanuel Ringelblum and Rachel Auerbach worked on the Korczak promotion also, and wasn’t there even something about him in the buried glass jar of documents that was miraculously *sarcastic* found in 1950’s Poland? You may watch Andrezj Wajda’s 1990 movie “Korczak”, here and read the beautifully illustrated children’s book “Janusz Korczak’s Children” by Gloria Spielman, here. Stefa, and the children after they boarded the train. Thus the question of their fate stays open. Hardly off topic, yesterday’s interesting reflexion by Paul Gottfried, “The Eternal German Guilt Trip”. There was a junction near Treblinka where trains could be “diverted.” Some of the trains from Warsaw went south to Lublin where the Majdanek camp was located. I have addressed this issue in a new blog post. Great. And an SEO tip to increase your page views – in wordpress remove the month, date, and year in your urls.